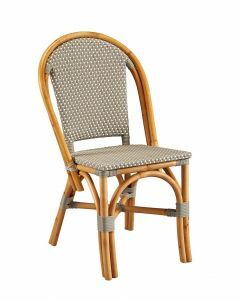 Sweeping lines of bamboo give this charming chair a welcome French accent. Cross stretchers and curved braces provide sturdy structure, and the resin weave adds visual interest as well as providing comfortable seating. This chair measures W:18 x D:20.25 x H:36. Click on images for greater detail. Please note this item is sold as a set of 2. Please note this item ships via motor freight. Freight charges calculated at checkout are approximate and additional freight charges may apply to your order depending on your location. If you are interested in purchasing this item, please email customerservice@wellappointedhouse.com for a shipping quote.